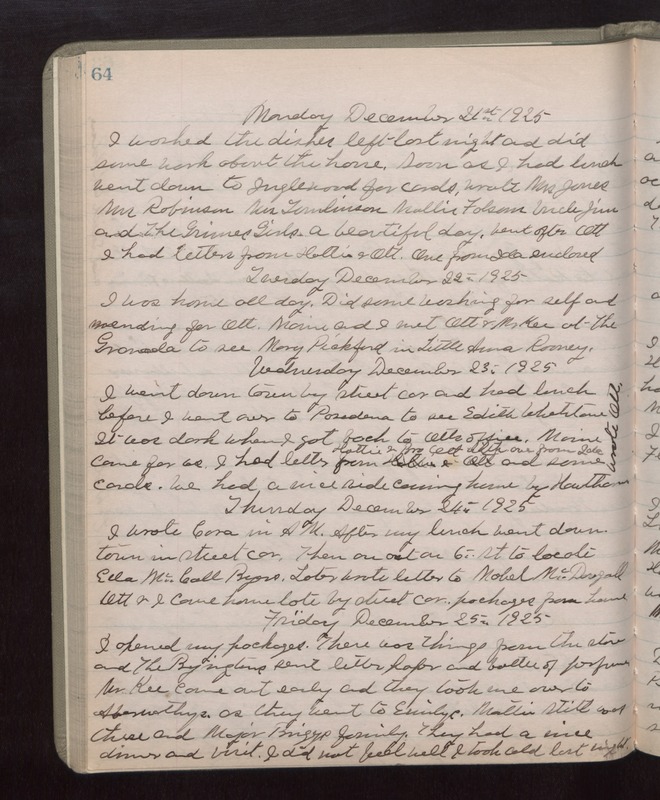 Monday December 21st 1925 I washed the dishes left last night and did some work about the house. Soon as I had lunch went down to Inglewood for cards. Wrote Mrs Jones, Mrs Robinson, Mrs Tomlinson, Mollie Folsom, Uncle Jim, and the Grimes Girls. A beautiful day. Went after Ott. I had letters from Hattie & Ott. One from Ida enclosed. Tuesday December 22nd 1925 I was home all day. Did some washing for self and mending for Ott. Maime and I met Ott & Mr Kee at the Granada to see Mary Pickford in "Little Anna Rooney." Wednesday December 23rd 1925 I went down town by street car and had lunch before I went over to Pasadena to see Edith Whetstone. It was dark when I got back to Otts office. Maime came for us. I had letters from Hattie & Bro Ott with one from Ida and some cards. We had a nice ride coming home by Hawthorne. Wrote Ott. Thursday December 24th 1925 I wrote Cora in AM. After my lunch went down town in street car. Then on out on 6th St to locate Ella McCall Byers. Later wrote letter to Mabel McDougall. Ott & I came home late by street car. Packages from home. Friday December 25th 1925 I opened my packages. There was things from the store and The Byingtons sent letter paper and bottle of perfume. Mr Kee came out early and they took me over to Abernathys as they went to Emilys. Mattie Stitt was there and Major Briggs family. They had a nice dinner and visit. I did not feel well. I took cold last night.